Bit of a crap week this week...my little cat, Sam, was hit by a car and killed on Monday. Died instantly, no pain, didn't suffer, etc, etc. Our other cat has been looking for him and needing a lot of support so not had much hobby time. Sam when he was about 12 weeks old. He would be one year old next month. My wife and I have been supporting each other and trying to distract ourselves (and Lyro, our other younger kitten). I haven't managed to paint anything, but did sit down and build for a few hours to distract myself. I'd seen some great conversions of Ixion with shield (see below) or with different weapon options, and If you've watched the video/read my earlier blog post then you'll know I intended to use some small magnets to given him the shield option.I didn't have any magnets small enough, so a small 1mm brass rod has served well enough. The project started with some VERY careful drilling and dry fitting to make sure I could preserve Ixion Hale as is. Few pictures of the options! What do you think guys? Good use of spare plastics? I've also built my Aquilon pattern terminators. Need a bit of gap filling, might get to that over the bank holiday! I went for 4 with spears, 1 with standard and sword, and 5 with sword and shield. One of them has a magnetised arm with a converted chaos power talon - I'm not sure if I like this given how nice the actual talons are...I have a Blood Angel power fist somewhere that I might convert to a claw instead...more bling and all that! Hoping to get some more painting done - end-of-the-month pledge rush and all that! Thought for the day: "Yime spent with cats is never wasted"
Another quick article to link in with a video due to appear on our channel this week: an unboxing, review, and my plans for the Warhammer World-exclusive Librarian in Cataphractii Terminator armour. As an Emperors Children player I didnt pick this guy up last year; partially as I had other purchases in mind (Brother Handro: "whatever happened to those Crimson Fists? "), partially due to the legion specific issues mentioned above, and partially because the IIIrd legion didn't make use of librarians....that one is a stumbling block really! Lets take a look at the kit! Nice details with the skulls, the scrolls and the face. The small skulls around his head are really well cast! You didn't want this in focus right? What ever could these parts be for....watch the video below to find out! Overall a great kit guys - if you were holding out on picking this chappy up then.....well....don't. Hopefully this week you will see a blog post demonstrating that he might not be as legion specific as you might think! Another post related to the Open day, "how long can they drag this out" I hear you cry! So as I mentioned in my on-the-day post, we were able to speak with Andy Hoare about the new Necromunda. Necromunda was the buzzword for the event, I'll try to break this down into some semblance of order! Andy spoke to us about the release itself. The box is sculpted by the Specialist Games team, but made in plastic. The boxed set is designed to be ready to play and to start with includes two gangs - Goliaths and Escher. These two gangs have 10 models each, which is made of two 5 model sprues. The kits, as I mentioned, will be plastic, and semi-multi pose in a way not dissimilar to the Scion kit - the torso/leg combinations each have close combat and ranged options, and the heads are/may be interchangeable and free to be posed as we wish. The gangs themselves consist of the same classes as before; Leader, Heavy, Ganger and Juve. They now have a different activation system, which I will get onto below. A key feature Andy spoke about was the progression/market/adding to gangs. They seem pretty keen for us not to destroy/convert our models once finished - think back to the old Gorkamorka models who would be cut up and re-built because an Orc lost an arm! If, for example, you wanted a lascannon, but had a heavy bolter Heavy. Rather than have that Heavy buy a lascannon at the market, you would add a lascannon Heavy to your gang. This way a gang becomes quite large, up to 20-30 miniatures. This is then countered by the use of a crew for each mission. Each mission will have information of how to build your crew. This might be do-it-yourself, it might say you must take x, y and z, or it might give you a random selection from your gang. Similarly, we asked how the rule set works. Expecting this release to be based on Shadow War rules, or even just a straight re-print, we were surprised to find that it uses a completely new rule set based on 8th Edition. Andy described it like this: Necromunda (Based on 2nd Ed) was easy to play because players knew 2nd, and learned the added special rules. Now most people dont know/play 2nd, but they do play 8th. The team want this game to share that familiarity, and so players of 8th Edition can pick this game up, and play safe in the knowledge that they know the basics. However, Necromunda 2017 has some key differences - first off they are doing away with the you-go-I-go system. Now there will be an alternate/split activation system where each model has 2 actions. These actions could be run, jump, shoot or other action that might be necessary. Each class (Leader, Heavies, Gangers and Juves) has different activation options. In this example a Leader can activate himself and then two other models in range. Heavies activate themselves and one other model in range, whilst Gangers activate themselves only. Poor old Juves can only activate themselves if they pass a dice roll similar to bottle/cool/Ld etc. In addition to this change in turn sequence the 8th edition base gets an expanded stat line with things such as Will power, Leadership and Cool. Timing was difficult to pin down. We had heard November from one source, but Andy seemed to suggest this would be sooner with the base game next month (Andy said "Very soon, not this month but very soon"), then hardback rules 2018 some time. Similarly, additional gangs, missions, objectives, hired guns and their respective rules would be released as supplements as time goes on. I tried to press Andy for some information regarding terrain. His answer was cryptic, but when I said "so there is no plastic terrain in the box", he said"No, but the box is ready to play". Card stock terrain? Going forwards we can expect FW upgrades to the plastic kits, as well as new plastics for other gangs. Many people, including myself, are very excited about this. I didn't play Necromunda, but played BFG, Gorkamorka and Inquisitor, and love the smaller skirmish games with character progression. I might well do an article in due course of my top 10 conversion bits for skirmish games - it is a big list! What do you think guys? Excited for Necromunda? TheHobbyButterflies - Live at the FWOD 2017! Our live blog from the FWOD 2017! Looking forward to the open day! Ah the Forge World Open Day! We go every year and usually come back with armfuls of resin goodness and a thousand photographs which sit unpublished on my computer! This year The Hobby Butterflies will be attending as usual, but we shall be publishing pictures of our discoveries, news of our purchases, and summaries of the conversations with the FW design team. The FWOD is a day where, placed in WHW with a credit card, I ponder the multitude of choices in front of me. The list of things I could buy is big this year! (Handro: Speak for yourself!) I clearly need to get Ixion Hale! 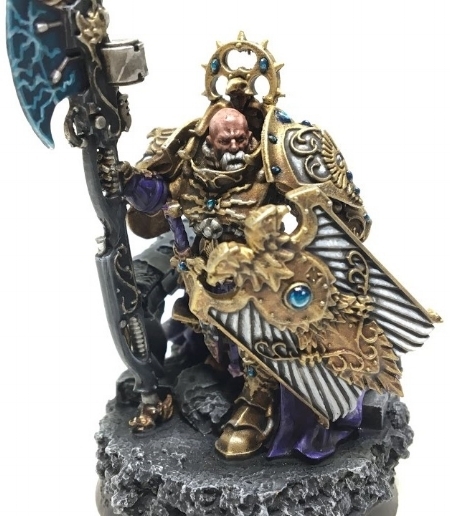 I have 2x5 custodes on sprue and think Ixion is the man to join them into a cohesive fighting force - In my head that means it is a project which is all bought, and jsut needs building and painting....easy right! 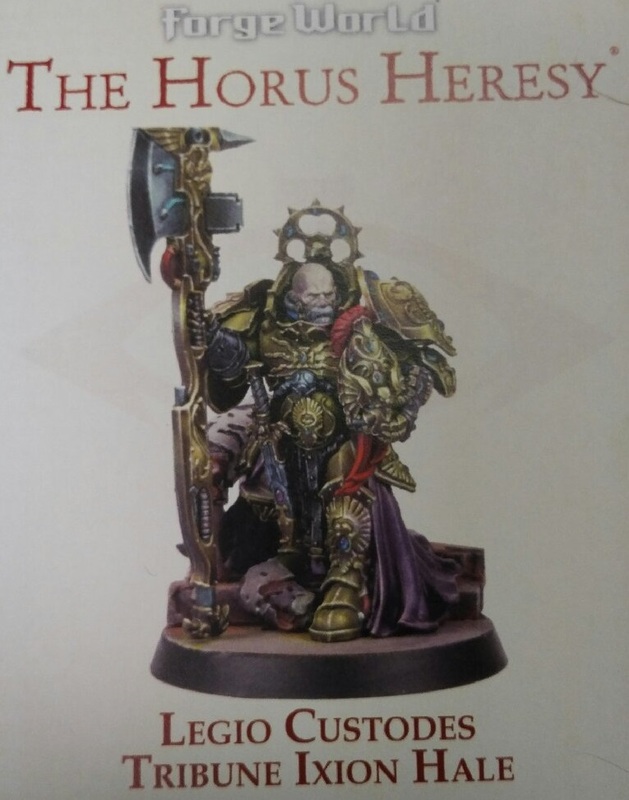 The new Blood Ravens character we all know and love from the Dawn of War series finally takes physical form and is, of course, very tempting also! 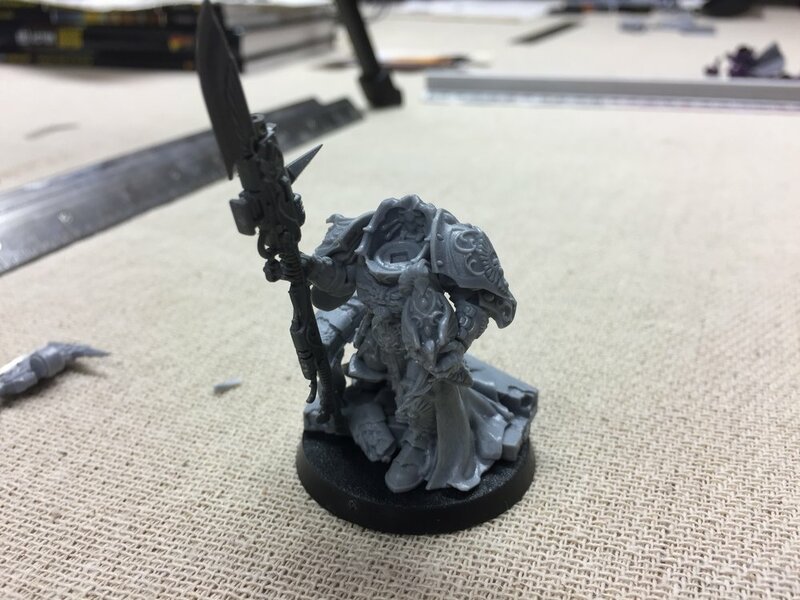 I haven't decided on my 40k marines/Primaris yet and the Blood Ravens would be a mighty fine option...alternatively, it is a gorgeous model that can be carved up as needed - see my upcoming look back at my conversion of the Primus Medicae! I also like the look of the three new Sicaran variants - two of the three we have already seen! The Arcus is my favourite and is already up for pre-order; it certainly looks like the plasma variant will be available on the day too! The above are all, of course, known about and already available - what new stuff will we see? Well it looks like we have news on that too! Clearly Custodes is the theme! The aquilon pattern terminators are gorgeous models! I am undecided between the two variants although the infernus firepikes certainly have the nostalgia factor. Considering the size/on table power these guys have £49 isn't too bad really. The sisters upgrade set is also nice, I have 5 sisters, and another five would be a nice addition with this upgrade set - not too high on my list though. We can see the two Sicaran variants top right - the omega looks a little off at first glance - Ill need to get my eyes/hands on it directly I suppose. The dropship is VERY nice! I know that my good buddy Handro has some views on the new custodes line of vehicles but this is a nice touch - Although for that money a Lancer comes first! I keep threatening to add to my IIIrd legion boys - Fulgrim and some more Phoenix guard terminators would be very pretty! As would a Stormeagle to fly them around in! The XXth legion are everywhere! 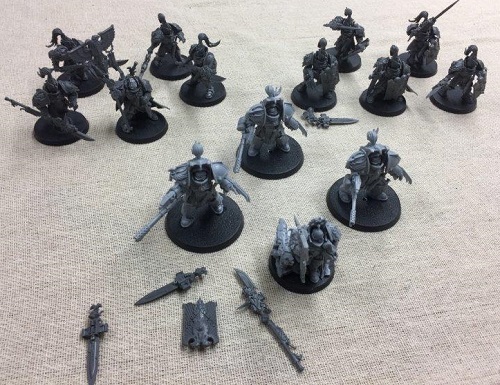 I have several parts (including Autilon Skorr) lined up for a potential XXth Legion project and keep meaning to pick up some XXth parts.....is this weekend the weekend? Things to look out for this Sunday! - Our live postings from the FWOD! - A bag full of grey stuff to add to the list. We will probably do a hobby day "live stream" on the monday, with pictures and an updating blog post during that day of our hobby progress! PS: 20 subscribers! Amazing - we hope you're all enjoying the blog. Don't forget to comment or get in touch with comments/criticism/ideas!